These images from Chicago protests over the last two years will spur you toward the ballot box. CPS high school students and supporters of #NoCopAcademy hold a “die-in” at City Hall in March 2017. The cardboard tombstones bear the names of people who’ve been killed by Chicago police and those of the schools and mental health clinics closed by Mayor Rahm Emanuel during his first term. Members of the Chicago Teachers Union hold a banner declaring "No Deportations No Anti-Black Racism No Ban" and "In Solidarity With Workers" at the annual May Day march at Union Park, May 1, 2017. A 2016 march on the south side in honor of all black lives taken by state violence. Organizers Assata’s Daughters and other demonstrators called for the abolition of prisons and police and the reallocation of funds into communities and basic amenities such as jobs, schools, health care, mental health clinics, and access to healthy food. Local artist Jamila Woods sings “Holy,” her healing anthem for black women, in Douglas Park during a July protest. Members of A Long Walk Home’s arts program for black girls gather around what they’ve dubbed “Rekia’s Tree,” in remembrance of Rekia Boyd, who was killed by Chicago police officer Dante Servin in the park six years ago. The girls were participating in a one-day public art program called the Visibility Project, which incorporated visual arts and performances for and by black women, girls, and femmes. 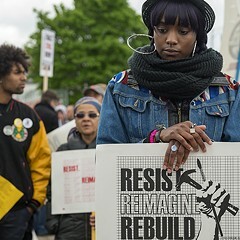 On May 1, 2017, the Resist Reimagine Rebuild Coalition organized a May Day march to draw the connections between racial justice and economic justice. Protesters gathered at Roosevelt and Ogden, between the Cook County Juvenile Temporary Detention Center and Chicago’s FBI headquarters. Thousands flooded the Loop for the #TransUpFront protest on March 3, 2017. The event was organized by a newly formed group called the Trans Liberation Collective. Chicago police officers and protesters march on opposite sides of the train tracks that run down the middle of 71st Street on July 16, 2018. 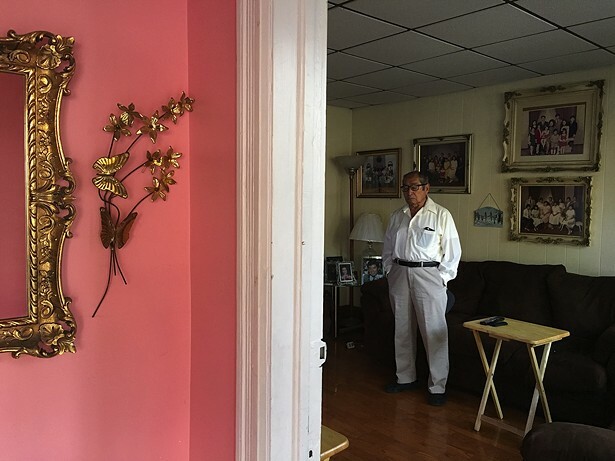 Two days prior, a white police officer shot and killed South Shore resident Harith “Snoop” Augustus two blocks from the 71st Street barber shop where he worked. Black Lives Matter Chicago, the Chicago Alliance Against Racist and Political Repression, and other community organizations rallied to call for justice for Harith, condemn CPD’s violent policing and criminalization of black communities, and demand community control of the police through a new Civilian Police Accountability Council. CPS high school organizers with #NoCopAcademy dance and chant outside City Hall after the March die-in. 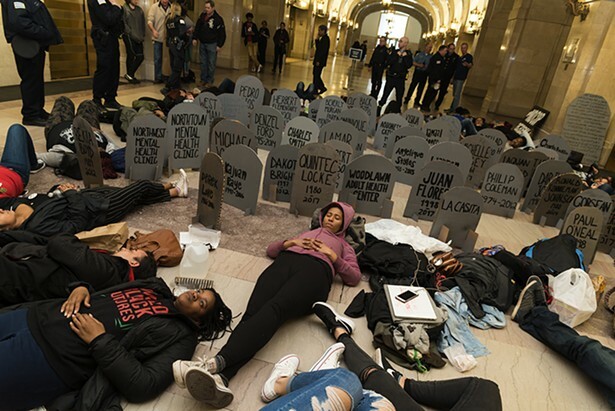 CPS high school students and supporters of #NoCopAcademy hold a "die-in" at City Hall on, March 28, 2018. 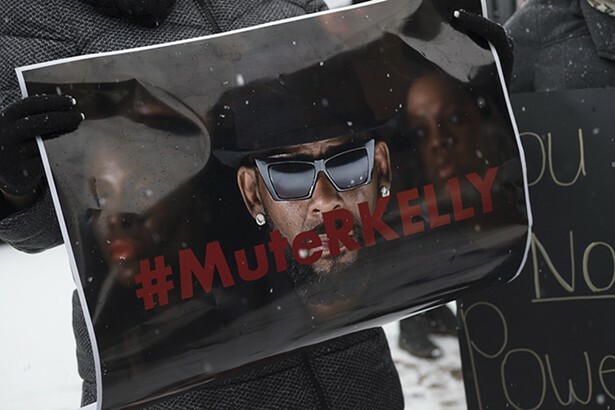 The cardboard tombstones bear the names both of people who were killed by Chicago police and of schools and mental health clinics Mayor Rahm Emanuel closed in his first term. A protester rallying against the inauguration of Donald Trump holds up a “Black Lives Matter” sign with Trump Tower in the background on January 20, 2017. 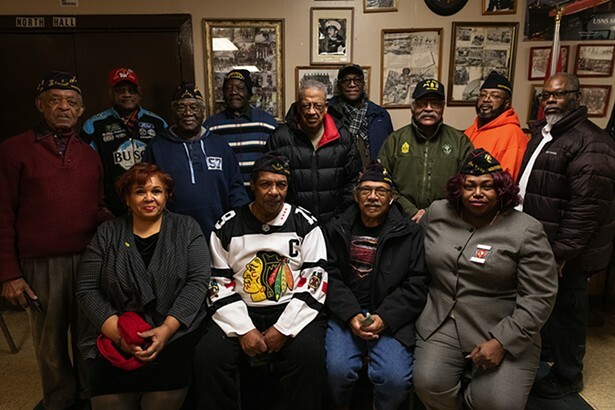 Hundreds marched through the Loop and the Michigan Avenue shopping district that night. A banner using the hashtag #SayHerName lifts up the names of trans women of color killed in the first two months of 2017 in the United States, March 3, 2017. The banner was carried at the #TransUpFront protest organized by a newly formed group called the Trans Liberation Collective as a response to the ongoing violence against trans people in the U.S. and the Trump administration's rolling back of protections for trans students. Members of #EndMoneyBail rally outside the Thompson Center on September 18, 2018. Participants held banners made up of seed packets which depicted the race of each person currently being held in Cook County Jail due to lack of funds. Each packet was filled with a 'bee-sustaining seed mix that symbolizes the potential of each incarcerated person's life to give back to their communities.'" A wooden sign is placed at the foot of a tree in Douglas Park inscribed with the names of Chicago area black women killed by police. As part of BYP 100's National Week of Action to #SayHerName, activists and organizers gathered on June 13, 2018 at a tree that they’ve dubbed "Rekia's Tree" in Douglas Park to hold vigil and to plant flower seeds to honor Rekia and other black women and girls killed by state violence. Organized Communities Against Deportations (OCAD) dropped several banners along the #FamiliesBelongTogether march route, June 30, 2018. The banners were used to send the message that families belong together and not in detention. These banners read "Decriminalize Migration To Keep Families Together" and "Shut Down [Attorney General] Jeff Sessions To Keep Families Together." In a statement, OCAD demanded the decriminalization of all migration; shutting down Jeff Sessions by any means necessary; abolishing ICE and divesting from all forms of policing and incarceration.